I was born in Strabane, Ireland, like the great Brian O'Nolan (aka Flann O'Brien, aka Myles Na Gopaleen), who would have been a great crossword constructor had he turned his mind to it. I started constructing crosswords more than fifty years ago while at college, and, after contributing to a variety of publications, got on the team at The (London) Times in 1975. I became Crossword Editor at The Times in 1995 and continued in that post until emigrating to the US in 2000 to join my wife Swapna. She has no interest in crosswords but we do work very closely together on a mission we would describe as humanizing mathematics education. I continue to contribute occasionally to the Times, and to the Guardian as Brendan (another Irishman who came to America, more saintly than me). I'm very proud of a postcard from Colin Dexter, creator of Inspector Morse, congratulating me on a clue: For whom right and wrong can go in ledger? (9,5), and who included a character named for me in one of the television mysteries. 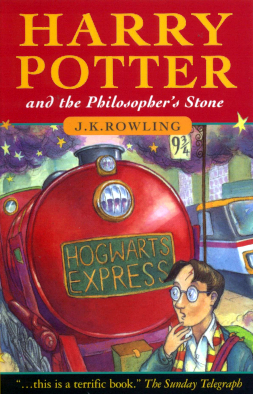 Having noticed the Harry Potter anniversary coming up, I decided to see if I could manage what for me is a completely different genre. I was able to do it finally with very patient help from Will Shortz. Then I asked Richard Rogan, current crossword editor of The (other) Times, to allow me to do another on the same theme and same day and he kindly agreed. I think having puzzles in both Times on the same day is a first. By the way, I've never read any of the Harry Potter books or seen any of the movies — they are surely great of their kind, but not my thing. HARRY / POTTER! Hard to believe it's been 20 years since the initial (British) release. The series is a large part of why I started writing middle-grade books — my brother once said how sad he was, that there might never be anything as good as this series. I like me a challenge! Speaking of a challenge, such a lot of thematic material packed in today. I enjoyed HARRY / POTTER snuck in at the very bottom, each word sneakily clued in non-Harry Potter ways. AS NEAT (that feels too much like a verboten six-letter partial, BTW) as it was to get DANIEL RADCLIFFE over HARRY / POTTER, there were some trade-offs to make this work. Early-week puzzles usually depend on two sets of vertical black square bars on the bottom of a grid to make filling easier — having just one (between AS NEAT and SNEEZES) is a rough construction challenge. Besides AS NEAT, there's an IER and the odd EFFS. That's not great, but not terrible either. I wouldn't have minded those prices to pay, except that there were already so many other gluey bits. I'm not sure why JK / ROW / LING gets split across the middle, but GHIJK is ... not good. That'd be a puzzle-killer for me. Along with AHOT, BLEST, ETH in the top of the grid, and a rough-for-newbies crossing in ASLAN / AGAS, it's too much for my taste. I would have been fine with less thematic material, perhaps with THE PHILOSOPHERS / STONE intersecting smack dab in the middle, HARRY POTTER 11 and JKROWLING 9, using a mirror (left-right) grid layout. The tough grid layout did allow for some nice bonuses like LOYALTY (Gryffindor!) and EGOTIST (Slytherin!). And ALASKAN got a great clue, "detached state" making me laugh. As a huge fan, I like the 20-year tribute. But I wish it had been a smoother product for a Monday. This is Mr. Greer's NYT daily crossword debut, but he has contributed three cryptic crosswords already. The grid uses 22 of 26 letters, missing MQVX. Average word length: 4.76, Scrabble score: 283, Scrabble average: 1.56.